On April 24, 1615, Champlain, Captain Pont Gravé and four Récollet fathers departed for New France aboard the Saint-Étienne. They arrived at Tadoussac near the end of May and continued on to Quebec. There, Champlain quickly dispatched orders to the habitants and continued up the St. Lawrence to the Rivière des Prairies, where he was greeted by a large group of Aboriginal people, including members of the Huron (Wendat) and Algonquin (Anishinabe) nations. They asked Champlain to assist them in their campaign against the Onondaga and Oneida nations, which posed a constant threat to fur trade routes along the upper St. Lawrence and Ottawa rivers. Having agreed to participate in the campaign, Champlain hurried back to Quebec to make the necessary arrangements. He was late meeting his Aboriginal allies at their agreed-on location but continued regardless, travelling first up the Rivière des Prairies and then along the Ottawa River to Morrison Island. His party then travelled to the Mattawa River and across it and other waterways to today’s Lake Nipissing. Throughout his travels, Champlain met with a number of Aboriginal nations and worked to promote alliances with the French. After meeting with the Nipissing nation, he travelled along the French River into Lake Huron and finally across Georgian Bay to a site near present-day Penetanguishene. 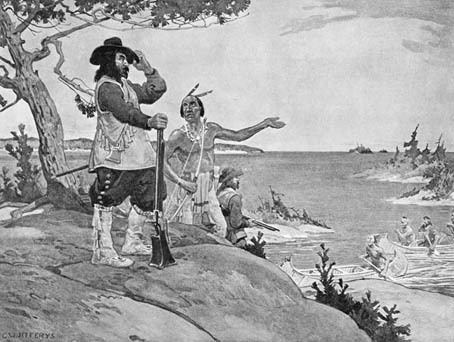 Champlain spent much time exploring Huronia and visited a number of the villages of the Huron confederacy, including Carhagouha, recording his observations and impressions as he went. He arrived at the town of Cahiagué on August 17, 1615, where he participated in planning and arrangements for the upcoming campaign against the Iroquois (Haudenosaunee). Champlain and his Huron (Wendat) companions departed Cahiagué on September 1 and were joined by their Algonquin (Anishinabe) allies near present-day Orillia. Together, they made their way south and east to Lake Ontario, along a route close to that of today’s Trent-Severn Waterway. On arriving at Lake Ontario, they followed its eastern coast, then travelled over land to the Oneida River and finally arrived at a fortified Onondaga town on October 10, 1615. Faced with this challenging obstruction, Champlain and his allies built a “cavalier,” or wooden platform, from which they could fire into the fort. They also attempted to set fire to its exterior walls, but their efforts failed. It soon became evident that the fort could not be penetrated. Two key Huron (Wendat) chiefs were wounded in the fighting, and Champlain suffered serious arrow wounds to his leg. A decision was made to retreat and await reinforcements, which were expected to arrive from the Susquehannock nation. Before Champlain and his allies departed Cahiagué, a delegation of 12 Huron (Wendat) warriors, accompanied by Étienne Brûlé, travelled south to enlist the support of the Susquehannocks, who were also at war with the Five Nations Iroquois. It is believed that part of their route south to Lake Ontario may have been along the “Toronto Passage” that connected Georgian Bay to the lake through a series of waterways and portages. If this is the case, and if Brûlé travelled down the Humber River, he was the first European to pass through the area that is now Toronto, as he made his way south to meet the Susquehannocks. Brûlé and his companions successfully recruited Susquehannock allies to participate in the campaign, but they arrived too late at the chosen meeting place. Tired of waiting, Champlain and his allies withdrew two days before their arrival. Due to his injuries, Champlain was carried part of the way in a basket. He expected to be taken to Quebec, but instead, his allies brought him back to Huronia, where he spent the winter of 1615-16. Champlain stayed for much of the winter in the cabin of Chief Atironta, who provided him with ample supplies. Champlain took full advantage of his time and travelled extensively throughout Huronia. He participated in a Huron deer hunt, which he observed with great interest, along with the natural landscape and wildlife of Huronia. In January 1616, he met Father Le Caron at Carhagouha and, during the weeks that followed, visited the Petuns, the Nipissing and the Ottawas. Champlain departed Huronia in May and arrived at Quebec on July 11, 1616. He never returned to Ontario, but his observations and writings profoundly shaped the early European history of the province.